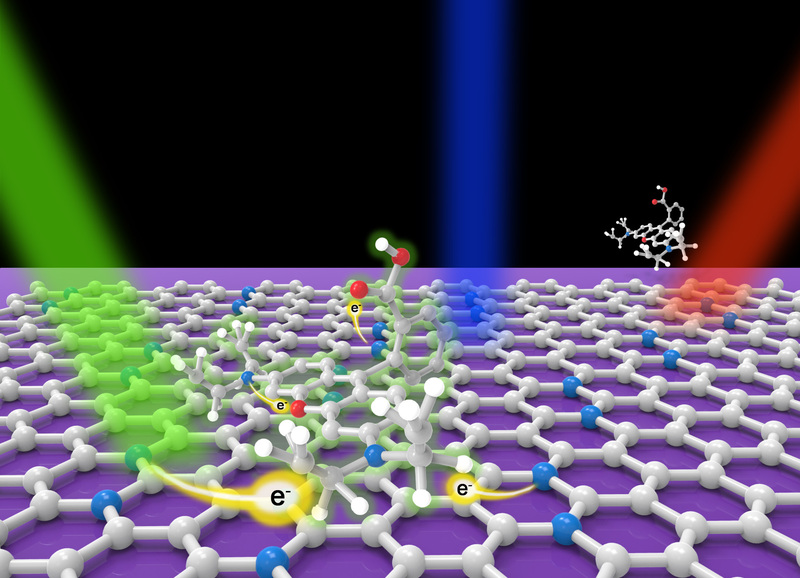 A highly sensitive chemical sensor based on Raman spectroscopy and using nitrogen-doped graphene as a substrate was developed by an international team of researchers working at Penn State. In this case, doping refers to introducing nitrogen atoms into the carbon structure of graphene. This technique can detect trace amounts of molecules in a solution at very low concentrations, some 10,000 times more diluted than can be seen by the naked eye. Raman spectroscopy is a widely adopted identification technique used in chemistry, materials science, and the pharmaceutical industry to detect the unique internal vibrations of various molecules. When a laser light irradiates crystals or molecules, it scatters and shifts colors. That scattered light can be detected in the form of a Raman spectrum, which constitutes a fingerprint for every Raman-active irradiated system. The team choose three types of fluorescent dye molecules for their experiments. Fluorescent dyes, which are frequently used as markers in biological experiments, are particularly hard to detect in Raman spectroscopy because the fluorescence tends to wash out the signal. However, when the dye is added to the graphene or N-doped graphene substrate, the photoluminescence -- fluorescence -- is quenched. On its own, the Raman signal is so weak that many methods have been used to enhance the signal. A recently developed enhancement technique uses pristine graphene as a substrate, which can enhance the Raman signal by several orders of magnitude. In a paper published online today, July 22, in the journal Science Advances, Terrones and colleagues reveal that adding nitrogen atoms to the pristine graphene further enhances sensitivity and, importantly, they give a theoretical explanation for how graphene and N-doped graphene cause the enhancement. “By controlling nitrogen doping we can shift the energy gap of the graphene, and the shift creates a resonance effect that significantly enhances the molecule’s vibrational Raman modes,” says lead author Simin Feng, a graduate student in Terrones’ group. Because of graphene’s chemical inertness and biocompatibility, the team expects that the new technique will be effective in detecting trace amounts of organic molecules. Elias is excited about the prospect of combing the technique with available portable Raman spectrometers that can be taken to remote places to detect, for instance, dangerous viruses. The fluorescent dyes they studied will make it fast and easy to see the presence of compounds inside biological cells. Because the technique is simple-- just dip the graphene substrate into a solution for a short amount of time – it should be feasible to create an entire library of the Raman spectrum of specific molecules, Terrones says. Other coauthors include Maria Cristina dos Santos, Brazil; Bruno R. Carvalho, Brazil; Ruitao Lv, China; Qing Li, China; Kazunori Fujisawa, Penn State; Yu Lei, Penn State; Nestor Perea-López, Penn State; Morinobu Endo, Japan; Minghu Pan, China; and Marcos A. Pimenta, Brazil. Funding was provided by MURI grants from the U.S. Army Research Office and the U.S. Air Force Office of Scientific Research. Agencies within their home countries provided support for the visiting faculty and students. Mauricio Terrones is director of the Center for Two-Dimensional and Layered Materials (2DLM) at Penn State. Contact him at mutt11@psu.edu.